Rolls of paper and large documents such as drawings and housing plans can turn an office into chaos. Not only can paper drawings and prints cause a messy environment, but they are also easily damaged and can get mouldy when locked away for long period of time. 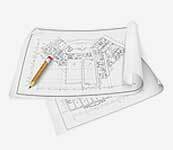 We have over 15 years of experience scanning large format files and drawings. Having worked with a variety of independent artists, large businesses and public-sector organisations such as councils and the NHS. We invest in the latest scanning technology so you don’t have to, and our large/wide format scanning services can help you cut down the costs. We can securely collect your paper documents from anywhere in London and throughout the UK and convert your paper files into your preferred digital format. Alternatively, if you have a large-scale scanning project and don’t want to send files to our scanning bureau, we can send a mobile scanning team to complete the work on site. Read more about our on-site document scanning service here.